If you're looking for a way to spice up your morning coffee, try a pumpkin spice latte instead of your regular brew. With a hint of spice and a head of foam, this latte is sure to wake up your senses. There are so many coffee and espresso drinks available at coffee shops, restaurants and even in your own home that many people fail to realize the difference between them. 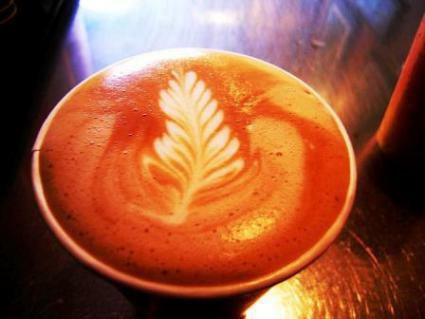 The word "latte" comes from the Italian "cafelatte" meaning coffee and milk. While in Italy, a café latte is served for breakfast and consists of stove top brewed coffee and scalded milk, the North American definition and drink have grown into something different. A latte ordered in the United States will consist of equal parts espresso, steamed milk and a layer of foam on the top. Pumpkin spices are usually defined as those which are used to flavor a pumpkin pie and include nutmeg, cinnamon and allspice. Pumpkin spices are available premixed, in a sweet, corn syrup based flavoring or you can make your own. A pumpkin spice latte may be flavored with actual spices, or with syrup depending on the recipe, or where it is sold. The pumpkin spice latte is a popular drink in many coffee shops around fall. The flavors of cinnamon, nutmeg and cloves invoke the feeling of fall, Thanksgiving and the celebratory feeling that surrounds this time of year. Depending on your tastes, you can create a pumpkin spice flavored latte that is perfectly suited to crisp fall mornings, and your palate. If you enjoy sweet coffee drinks, try this pumpkin spice syrup in your latte. Make sure to have an empty bottle or container on hand to store the syrup in, as only a tablespoon at a time will be added to the coffee. Combine the water and sugar in a saucepan on the stove and bring to a slow boil. Add the spices and reduce the temperature. Simmer the mixture for seven to eight minutes and remove from heat. Strain the syrup through cheesecloth to remove the spices and store the liquid in an air tight container until used. If you desire a latte with a lot of spice, but no sugar or sweetener, add the following ground spices to the bottom of your cup before you pour in the coffee or the milk. Alternatively, if you are brewing hot coffee in place of espresso, to be mixed with scaled milk in the tradition of a true Italian café latte, add the following directly to the coffee grounds before water is run through them. Serve a spiced latte alongside a desert of gelato or ice cream for a contrast of temperature. Offer cinnamon scones at breakfast alongside a sweet flavored latte. Serve pumpkin lattes after a dinner of curry, pasta or roasted vegetables. Try pumpkin lattes along with apple cider donuts for a true taste of fall. Enjoy a pumpkin spice flavored latte with fresh picked apples or other fall fruit. Pumpkin spice flavored lattes are sure to be a treat at any time of year. Make your own at home instead of waiting for the coffee shops to bring them out again and spice up your coffee today.